Today – Wednesday August 15 – is Victory in the Pacific Day commemorating the end of World War 2 on August 15 1945 – 73 years ago. 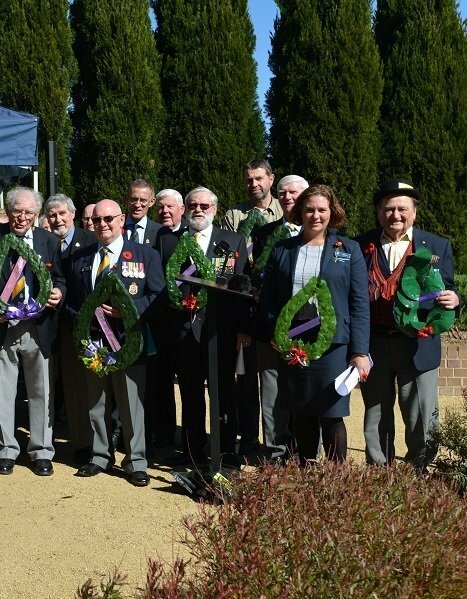 Epping RSL Sub-Branch observed V-P Sunday with a service in the Epping Club and wreath laying ceremony at Boronia Park Cenotaph, pictured above, and this morning, held a ceremony at the Boronia Park Cenotaph. 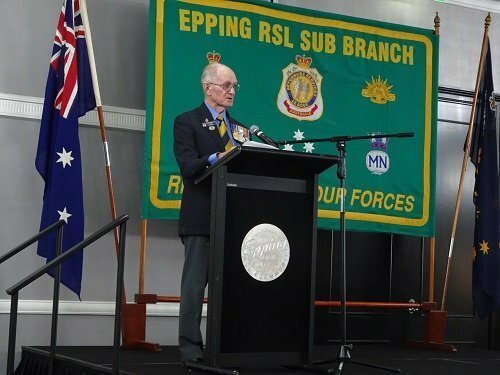 Epping RSL Sub-Branch vice president Captain Brian Swan AM stood in for guest speaker Brig Dr David Leece who was ill on Sunday at the Epping Victory in the Pacific 73rd annual commemoration service in the Ballroom at the Epping Club. 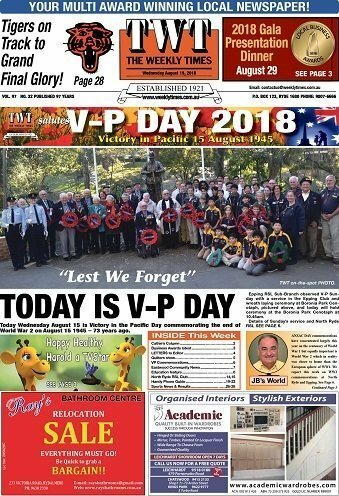 Brian read Dr Leece’s address which said that VP Day is also referred to as VJ Day or Victory over Japan Day “which for Australians after nearly three years of total warfare in the Pacific meant that the Second World War was finally over”. 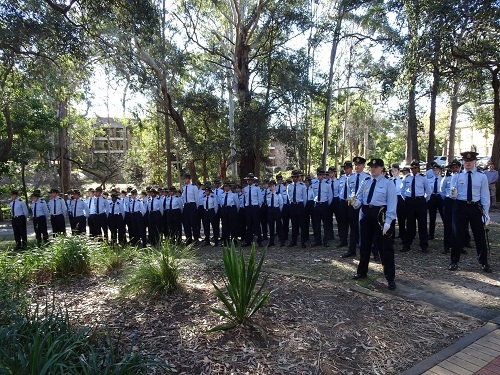 The 322 Squadron Australian Airforce Cadets were well represented on Sunday led by Squadron Leader Merridy Thompson and provided the catafalque party. 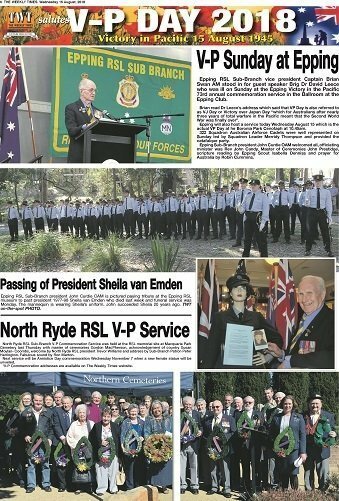 Epping Sub-Branch president John Curdie OAM welcomed all, officiating minister was Rev John Candy, Master of Ceremonies John Prestidge, scripture reading by Epping Scout Isabella Denniss and prayer for Australia by Robin Cummins. 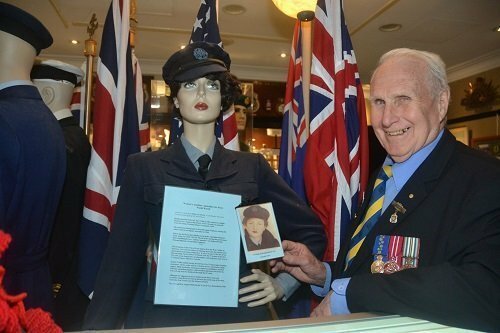 Epping RSL Sub-Branch president John Curdie OAM is pictured paying tribute ant the Epping RSL museum to past president 1977-98 Sheila van Emden who died last week and funeral service was Monday. The mannequin is wearing Sheila’s uniform. 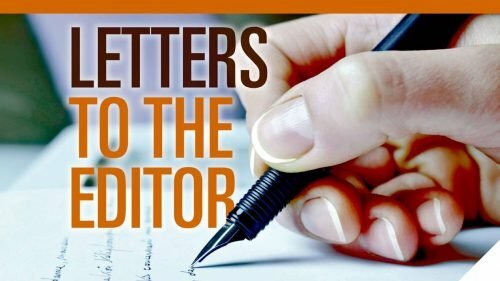 John succeeded Sheila 20 years ago. TWT on-the-spot PHOTO. 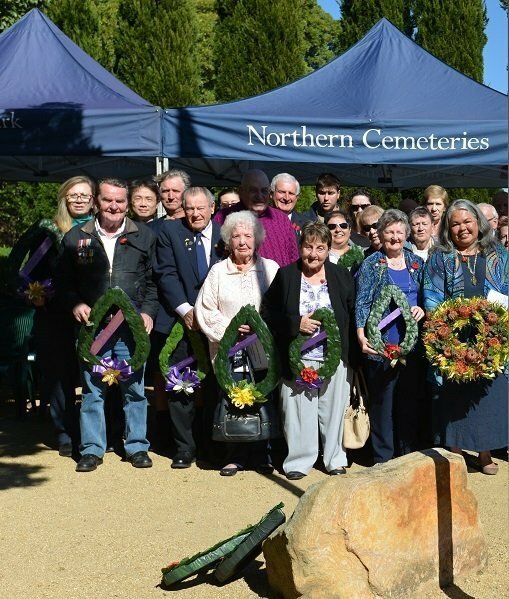 North Ryde RSL Sub-Branch V-P Commemoration Service was held at the RSL memorial site at Macquarie Park Cemetery last Thursday with master of ceremonies Gordon MacPherson, acknowledgement of country Susan Moylan- Coombs, welcome by North Ryde RSL president Trevor Williams and address by Sub-Branch Patron Peter Harrington. Fabulous sound by Ron Marton. Next service will be Armistice Day commemoration, Wednesday November 7, when a new female statue will be unveiled.